Shortly after we finished our breakfast we heard the doorbell. We expected it to be Pedro, but outside the door was Pedro, José, Ada (Pedro’s sister), Galia (Pedro’s daughter) and Annie (Pedro’s niece) and they brought a huge flower arrangement for us. They told us that it would take to much time for us to go to the tobacco plantation, so José had called them and gotten one of them to come to Pinar del Rio instead. So we placed all five of them in the back seat, stopped outside a house where José ran in and came back after a couple of minutes with a package wrapped in newspapers. We continued out of town towards the small beach town. The roads were pretty bad, so the 20 km took a while, but finally we arrived and stopped at a small restaurant that were normally only for locals (paying in pesos, not CUC). We opened the newspaper package and found a big box of Cohiba Robusto. The price was 120 CUC, which is a lot cheaper than in the official stores where it would cost 340 CUC, so we agreed to buy it. At the restaurant we had some refreshments, the girls showed us their Christmas presents (in Cuba they exchange gifts on January 6th (Epiphany)) and still had a lot to talk about. José had been to a cell phone store in the morning, checking the phone he got from us, and they told him that in Cuba it would easily be sold for 220 CUC, which is a lot of money for them. We explained again that the phones didn’t cost us anything, that they were no longer in use in Norway. After a bit more relaxation we were served a huge platter of lobster. We had a late (but big as always) breakfast and were not very hungry, but José kept feeding us with lobster. And it was really, really good! After eating it was time for some swimming, and we walked down to the beach. Actually there was not much of a beach, but long piers going out in the shallow water. We walked to the end of the pier, sat down to look at the beautiful surroundings for a while before we jumped in the water. We brought our snorkling gear, and saw plenty of fish, a crab and a jellyfish. Two local kids joined us, and the boy got to borrow one of our diving masks for a while. He quickly got a hang of it and went diving for shells that he brough on shore. Galia, Annie, Ada and Pedro also came down after a while, and they told us that it was the very first time on the beach for the girls. So glad we decided to take them there! Pedro also borrowed a mask and a snorkel. It was his first time ever, and Fredrik had to go into the water to show him how to do it. 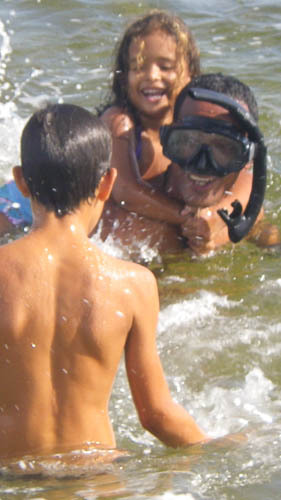 He was so exited about everything he could see, and when his daughter wanted to go with him, he continued to use the snorkel while she was sitting on his back. We relaxed a bit more at the restaurant terrace, having a couple of beers and drying up, before driving back to the city. José paid for everything. On the way back all five in the back fell asleep. 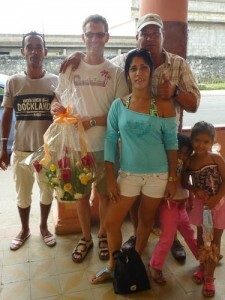 We paid for the cigars and gave them a big bag of clothes and other stuff. They could pick what they wanted first, and the rest was for the people at the plantation. After a quick shower and a change of clothes, we were all back in the car. This time we were going to a birthday party to the son of a friend. Ada had dressed up in one of Gunnhild’s old t-shirts, and the girls had beautiful dresses. The party was in the street, and it was full of kids and grown-ups. There were some benches, but most people were sitting on the sidewalk. Some of the kids were playing “kick the can” without a can. All kids (and tourists obviously) got a cardboard box full of Cuban cakes. We were still not hungry, and especially not for cakes, but we managed to finish most of the box while sitting on the sidewalk with the others. We also brought presents to the birthday boy of course. He got a baseball that we bought in Santiago de Cuba, and lots of paper and color pencils. The highlight of the party was the Piñata. They didn’t hit it with a stick as we expected (probably to be able to reuse it), but opened it from the balcony while kids and grown-ups were standing below “fighting” for the gifts inside. From what we could see there was a littlebit of candy, but mainly it was pencils and school supplies. And the kids were jumping for joy over their brand new pencils. In the car on the way back, we gave the rest of our papers, color pencils, hairbands etc to Galia and Annie. We parked the car outside the casa, and went back to the roof terrace at the 12th floor. This time we ordered a bottle of rum right away, and we also brought 4 of the Cohiba sigars and shared them with José and Pedro. We were still not hungry, but it was clear that our friends were really hoping for something to eat, so we ordered some small tapas dishes. At least that’s what we tried to do, but it was not small and it was not cheap. But everyone got very full and very tired, so we actually left before the bottle was empty. Pedro brought it home, and would save it for another evening.